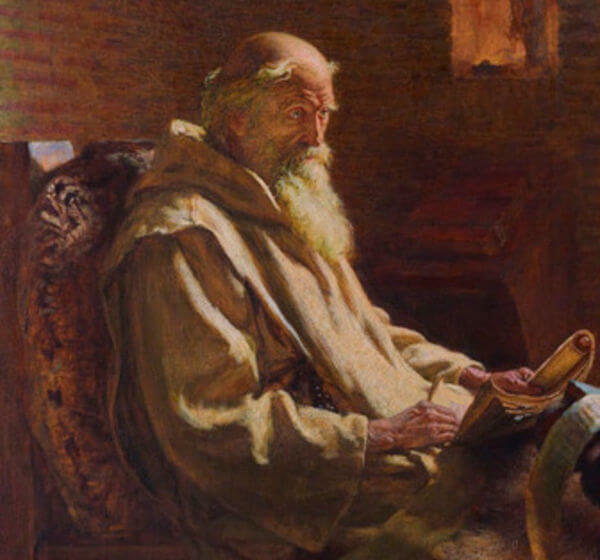 May 25 - Saint Bede the Venerable, Priest and Doctor - Optional Memorial - My Catholic Life! There is no world bigger than a monk’s cell. Those four, high walls shape thought like hard, steep banks contain the flow of a river. Rock curtains hanging on both sides force the raging river to carve a path through the landscape, always forward, always deeper. Here the tall banks stop the pounding river from pouring over into the plains. There the low banks allow the gentle current to run low and straight. A river without banks is a lake. And a mind without borders is a puddle—no forward movement and too shallow to sustain life. Borders, limits, and guardrails have expansive effects, paradoxically. A frame makes a painting burst to life; orderly lanes push traffic forward; and the edge of a canvas focuses the artist’s skill. Big thoughts start with boundaries. That’s why big thoughts happen in small spaces. Many thousands of monks’ minds were molded by the limits of the four, cold walls of their cells. And these scholar monks and saint monks gave birth to what we now call Europe. Today’s saint was a model monk who lived his whole life in an English monastery, although he occasionally traveled to neighboring communities to teach young scholars. Venerable Bede’s cell and monastery were nothing like those impressive stone structures with soaring arches and large courtyards, which still stand as icons of medieval Europe. Bede lived long, long before that golden age of monasticism. He died less than two hundred years after Saint Benedict, the founder of monasticism. The monasteries of Bede’s era were more like farms, where the monks lived in a dormitory above a large chapter room or perhaps even in crude huts huddled around a squat stone church. These first simple efforts to plant religious life into English soil matured, over centuries, into a network of enormous English monasteries. And these monasteries, in their fullest flower, grew into the universities, towns, schools, hospitals, lodges, cathedrals, and trade centers of England itself, a rich garden of Catholicism known in medieval times as Mary’s Dowry. Venerable Bede and his monastic brothers planted. Later generations harvested. And King Henry VIII then confiscated the garden and handed it over to his friends, who uprooted its most beautiful plants. Ironically and sadly, the tombs of many English saints, including Venerable Bede, lie today in Protestant churches. From his cell in remote England, Bede was enmeshed in the Church matters of his day. He became involved in the long simmering dispute over the date of Easter, promoted the practice of using Christ’s birth as the starting date for calendars, translated Christians works from Latin or Greek into Anglo-Saxon (to the immense good of the growth of the Church in England), and authored numerous works, the most famous of which is a history of the Church in England until his days. He was, in short, a prolific and wide-ranging scholar. In 1899 Pope Leo XIII honored that reputation by naming him a Doctor of the Church, the only native of England to be so honored. Thomas à Kempis, in his spiritual classic The Imitation of Christ, writes that every time a monk leaves his cell he comes back less a man. It is in the cell that the monk learns everything he needs to know about himself, the world, and God. It is inside of our vocations that we find God’s will and our own fulfillment. A deep and abiding commitment to a specific person, a specific religion, a specific home, job, school, parish, spouse, and family is the stuff of life. Wandering is fun for a while. Commitment, though, is more exciting in the long run. The banks of the river must be built up. The edges and borders stacked high. The rails set in place. Then, and only then, life starts to be lived. To go deeper, not wider. To run those roots down deep into the moist soil. When we leave the four corners of our commitments and vocation, it may be liberating for a while, but time rectifies the deception. Our vocation is our home, and in that home we find happiness, make others happy, and satisfy the divine plan of the God who made us. 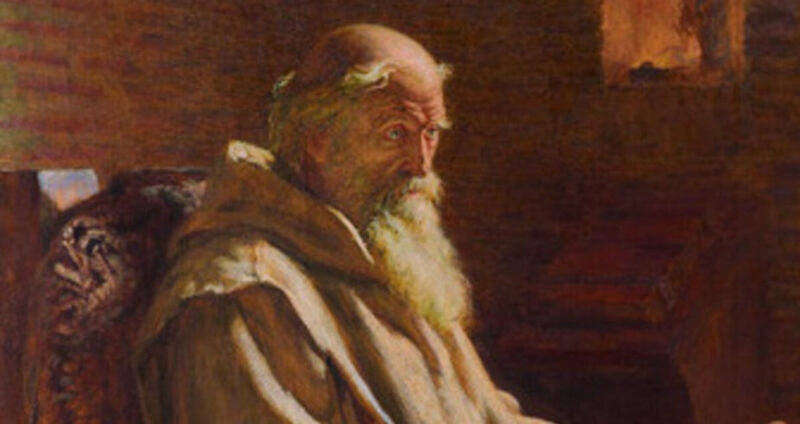 Bede the Venerable, we see in your life a model of commitment to one place, one idea, one love, and one Church. We ask your intercession to aid all scholars, all monks, and all who waver, to stay at their desk, their kneeler, or their work bench to fulfill the task at hand.